It’s October! Guess what! We’re down to two months before the year folds into a new one! Pretty exciting! By this time, we hope you already got a hang on a few holiday saving tips, learned hacks and tricks on shopping, caught ideas to become a part-time boss this season and read tips to create discount strategies for your businesses. Now, it’s about time to get the starter-pack to gear your business for the holidays! The holidays as business folks all know is the time when customers are at their most vulnerable state as they love to reward themselves and spend gifts for others, so give them the full experience of your business. To do that, we give you a 12-tip guide on how businesses prep up for the holidays. 1) Offer Holiday Treats In Your Store. How would you feel when you’re offered a treat? Feels great! Well, the way to your customers’ heart is through their stomach in this case. Offering a tray of holiday treats makes your customers feel valued. Taste is one of the big factors in marketing at a personal level. This affects sense of sight, touch and smell thus intensifies your customers’ experience. So offer that “grab treats” display by your counters. 2) Play The Holiday Music. Another tip in the starter-pack is to play holiday tunes this season. This is really a trance to make your customers’ mood get into the whole experience of your business. Research suggests that shoppers tend to spend more money and time depending on the tempo of the background music. An upbeat tempo causes your customers to move fast without affecting the volume of sales, while low-tempo beat allows your customers to move slowly but gives them ample time to buy more. For restaurants, diners spent more time eating their meals and ordering more food with a mellow and classical taste of music. Now, get that holiday playlist on. Nostalgia is a very powerful way to tug the emotions of your customers and the holidays present a time to walk down the memory lanes. You can do this by playing music of the 90’s, 80’s and so on. Doing so will do well for the 90’s kids who are now at their 20’s, or 80’s kids who are now on their 30’s. You might also want to display old items from the past such as vinyl records or other items that establish connection. This allows younger generation to discover the past and of course to tickle the nostalgic feeling for the older generation. 4) Add a gift-wrapping station. It’s a busy time of the year and you want to give the best service to your customers. Adding a gift-wrapping station is a relief for your customers who are the buy and wrap type of shoppers. Plus, you get a little extra cash for selling gift supplies. 5) Create Personalized Greeting Cards. For your die-hard customers, make this time even more special with holiday greeting cards. Be wary to avoid making your greeting cards look like an advertisement. Just let the greeting card remain a greeting card. You include a little something at the end like offering a surprise gift for OFWs during Christmas day. 6) Time for gift baskets. The idea for the gift baskets is to give a tremendous flare for fun! Since it’s the holidays, a gift basket is your business’ chance to be creative and artistic. Clever trinkets and cute gift items in a container is a plus factor for a charming presentation. Most customers will dig into this gift basket item service. 7) Dress Your Business In Holiday Style. What’s the holiday season without holiday ornaments to stylized your businesses? Giving a theme for your businesses creates the feel for everything. Get started and hang those decorations to welcome your customers in with a cheerful spirit. 8) Start A donation drive. Live up to the season of giving and sharing. With all the blessings pouring in, it’s a positive vibe for businesses to give back. This adds up to the value of your business’ reputation. Giving a stand to contribute for society allows customers to think that you are more than just looking for profit. Plus, this allows the community to get involve building a stronger business-customer relationship. 9) Make it family-oriented and child-friendly. Set up a nook where kids can read, play and have fun. It is a family-oriented season after all, so come up with ways to get families involve into your business. One cool idea to do that is to dress up as Santa for the kids and offer candy canes. Fun! 10) Think of a 12-day contest. It’s pretty hype to hold a 12-day contest or gimmick for your customers. This allows much more participation for them. You can hand out prizes to keep your customers excited or feature a product or service on that day for your customers to look forward at something until the 12th day. 11) Give Social Media A Holiday Touch. Social media marketing is everything at this age. If you have a good following on your social media pages then take the time to create good holiday content. You can make graphics and a holiday video to start with. Keep them engaged and connected. 12) Imbibe the Holiday spirit. The holiday season is the chance for businesses to get down with gimmicks and tricks to give customers a treat. The best thing do to as a business owner and business partner is to put yourselves in the shoes of your customers. 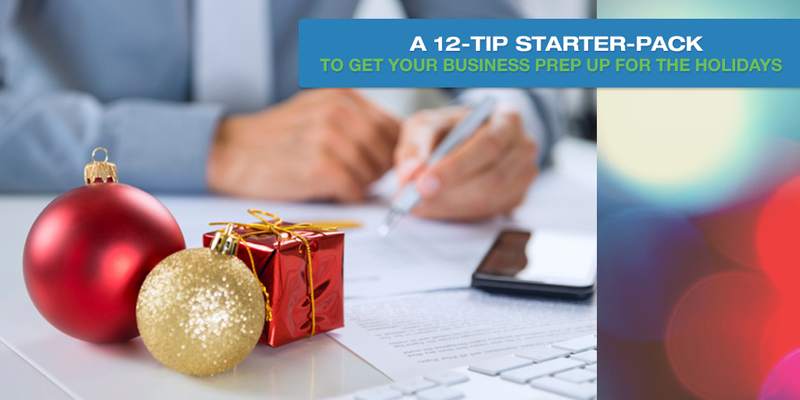 That way, you can give the right touch to prep up your businesses for the holidays. If you really want to give your customers the full holiday experience but need a little budget to step up your game, you can always go to PawnHero for a little extra. Just visit the website to learn more. Plus, you can try out the newest online shop, Marketplace.ph, where you ca get authentic pre-loved items at a bargain price. Don’t forget to like PawnHero Philippines and Marketplace by PawnHero on Facebook for games, updates and cash prizes. Kenneth finds his heart through writing. He is a mortal open for romance, adventures and experiences. He is an imaginative owl by night and advocates humanity, beauty, love and nature by day.